Lucky French Taxpayers: All Hail Francois the Merciful! I realize it’s wrong, but I can’t help cheering for France’s socialist president. Francois Hollande seems determined to raise every tax, expand every program, and augment every bit of red tape that afflicts the French economy. I fully expect this to end poorly, but at the risk of admitting that I’m chauvinistically concerned first and foremost with the United States, I think it will be helpful to have France as an example of why class-warfare tax policy is a bad idea. In other words, even though I’m quite fond of many of the French people I’ve met, I’m willing to sacrifice the people of France to save the people of America. Having explained what’s at stake, now let’s mock Hollande’s latest bright idea. I’ve previously highlighted his support for a 75 percent income tax rate on the so-called rich. Well, he also wants to increase the wealth tax so that the French government arbitrarily seizes as much as 1.8 percent of a household’s assets every year. Some people – doubtlessly selfish and evil libertarians – have pointed out that the combination of these two levies could result in someone having an annual tax bill equal to 90 percent, 95 percent, or even more than 100 percent of annual income! 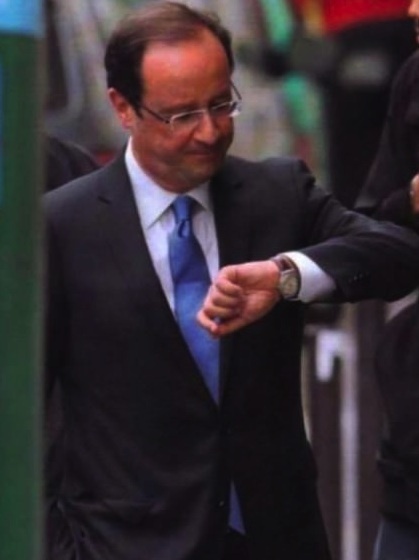 But here’s where Monsieur Hollande shows that he is a magnanimous and thoughtful soul. He has decided, out of the kindness of his heart and with generosity of spirit, that no taxpayer will ever have to pay more than 80 percent of their annual income to the government. All hail Francois the Merciful. He puts the Sun King to shame. Here’s the relevant excerpt from a Tax-news.com report. The government is therefore planning to restore the ISF tax to the scale that was applied prior to former French President Nicolas Sarkozy’s 2011 reform. Prior to the reform last year, the tax scale comprised six tax rates varying between 0.55% and 1.8%. This compares with the current simplified ISF tax of 0.25% imposed on assets of between EUR1.3m and EUR3m and 0.5% on assets in excess of EUR3m. The government forecasts additional fiscal revenues from the measure of around EUR1.3bn. Given the constraints that it has been working under, the government aims to re-establish a cap of 80% of income, to ensure that taxpayers do not pay more than 80% of their income in ISF, income tax or social contributions. But there’s one point I don’t understand. Like Vice President Biden, Hollande has asserted that entrepreneurs, investors, small business owners, and other “rich” taxpayers should welcome high tax rates so they can express their patriotism. So why, then, is he limiting their love of government country to 80 percent? Monsieur Hollande is also boosting the minimum wage, so I guess it will also be patriotic to be unemployed. And his predecessor, the de facto socialist Sarkozy, also had an interesting way of looking at the world. When he launched an initiative to clamp down on welfare fraud, he wasn’t talking about going after the people who illegitimately mooch off the government. He was targeting taxpayers who objected to paying for the fraud. Those unpatriotic scoundrels! Just goes to show that Obama will have to try much harder if he wants America to be more statist than France. P.S. Hollande’s policies already are having an impact. France’s richest person apparently isn’t very “patriotic” and has decided to move where he will be allowed to keep more than 20 percent of his annual income. The ordinary French created a big thug, the state, to go eat the extraordinary and throw a few stakes to the ordinary (“better than nothing thought the lemmings”). But the big thug is now eating the last few remaining extraordinary. Soon the hungry thug will eat the very ordinary who created him. But wait a second. That is already happening. The average French family living in a 1000sqf apartment, on two 1200 euro salaries, 20+% VAT on everything they buy and a host of other invisible taxes that drive the price of everything to stratospheric levels, does not have the idyllic life Americans at Starbucks think they do. But Americans are going to have to discover that for themselves. They are now hooked on the same irreversible path to decline. And nobody ever returns from that journey. Only hitting bottom or some catastrophic event like annihilating war (that in itself due to collectivism) has ever broken the cycle that forms when a near majority of voters start hoping that someone else, some distant other, someone smarter, someone more competent, or someone simply harder working will labor to insulate them from the consequences of mediocrity and will allow them to maintain the six times average worldwide prosperity level they enjoy now. The three billion awakening emerging world souls, who are in the process of finally liberating themselves from mandatory collectivism, have little desire or patience to see how the western world’s experiment in majoritarian mandatory collectivism ends. The sixty five million French are being dispatched in short order by a rising sea of humanity growing at five percent annually. So will most of the remaining one billion or so western voter lemmings, including Americans who are now in the grips of the same vicious embrace to decline. I seem to recall Joseph Schumpeter being happy about the Russian Revolution for similar reasons. Max Weber stormed from the room upon hearing this. I think that this is different because you already know what will happen and hope that we will learn from it. Schumpeter, on the other hand was much more objective, coldly so, and despite being pro-capitalist, had relatively high hopes for socialism. And of course, Hollande is no Lenin, let a lone a Stalin. Also, take a closer look at the picture of Hollande in this post. He is looking at his wrist as though checking the time despite the fact that his watch is facing the other way. Silly socialists!